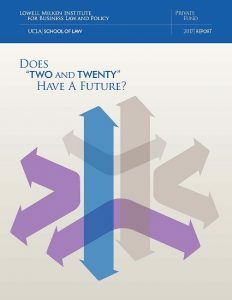 The 2017 Private Fund Conference Report: Does ‘Two and Twenty’ Have A Future?, was published in May 2017 and presented at the Private Fund Conference. Incentives play a crucial role in Private Equity and Hedge Funds. Investors are looking for high returns at a time when many private funds are struggling to beat conventional indices. Regardless, the traditional “Two and Twenty” compensation structure allows many fund managers to still earn substantial revenues even when performance is inconsistent or lags lower-cost public market options. Many frustrated investors are re-examining the assumptions that underpin compensations structures that include both an annual management fee (regardless of results) and an explicit performance fee (which can produce eye-watering sums when investors make substantial allocations). Institutional investors need access to proven managers who have demonstrated the skills and judgment necessary to earn high returns. Conversely, generous fee structures can degrade otherwise high returns earned by managers. What should be done to ensure that interests are sufficiently aligned between fund limited partners and fund general partners to ensure that each side gets the full benefits of the bargain they wish to make? Is there room for an increased role by the Securities and Exchange Commission to police fee structures in private funds? The 2016 Private Fund Report: Public Pension Plans and Private Funds – Common Goals, Conflicting Interests, was released in May 2016 in conjunction with the Private Fund Conference. The 2016 Private Fund Report and Conference examined some of the challenging aspects of the relationship between public pension funds and private funds including fees and expenses charged by private funds and whether and how private funds make it more difficult for public pension funds to fulfill their fiduciary duties to their beneficiaries. These highly-charged issues have received significant attention from academics, regulators, politicians and the public at large and will remain at the center of discussion for some time to come. The 2016 Private Fund Conference included a group of distinguished panelists from the academy and the fund industry: C. Dabney O’Riordan, Associate Regional Director, Securities and Exchange Commission’s Los Angeles Office; Eileen Appelbaum, Senior Economist at the Center for Economic and Policy Research; Lorelei Graye, Independent Consultant for Conifer Financial Services and Founder of Leodoran Financial; James Park, UCLA School of Law; Paul Rose, Frank E. and Virginia H. Bazler Designated Professor in Business Law and Executive Director of Moritz College of Law’s program on Law, Finance and Governance at Ohio State University; Leigh Anenson, Robert H. Smith School of Business, University of Maryland; Stephen Bainbridge, William D. Warren Distinguished Professor of Law at UCLA School of Law; Ashby Monk, Executive and Research Director of the Stanford Global Projects Center; Cary Martin Shelby; De Paul University ; Natalya Shnitser, Inaugural David and Pamela Donohue Assistant Professor in Business Law at Boston College Law School. The 2016 Report addresses several perspectives on the types of fees and expenses charged by private funds, the potential and actual abuses arising out of those charges and possible remedies. In addition, the Report considers several aspects of fiduciary duty owed by private fund general partners to the limited partners and owed by public pension funds, in the role of limited partners, to their beneficiaries. 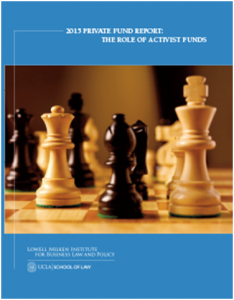 The 2015 Private Fund Report: The Role of Activist Funds, became available in March 2015 and was presented at the Private Fund Conference. The report and conference provided a range of views and opinions on activist funds, their role in investing, and their implications for the investment industry. The 2015 Conference included a group of distinguished panelists examining the state of private funds and how activist investors are changing the landscape. Speakers and panelists included notable leaders including Anne Sheehan, Director of Corporate Governance, CalSTRS; Marshall S. Sprung, SEC Asset Management Unit; Stephen Bainbridge, UCLA School of Law; Patrick Foulis, The Economist; James R. Gregory, Tenet Partners; Alper Ince, Pacific Alternative Asset Management Company; David C. Karp, Wachtell, Lipton, Rosen & Katz LLP; Christopher Kiper, Legion Partners; Darren Novak, Houlihan Lokey; Timothy Spangler, Lowell Milken Institute and Sidley Austin LLP; Peter Stein, Angeles Investment Advisors; Glenn W. Welling, Engaged Capital; Steve Wolosky, Olshan Frome Wolosky LLP, with many of these leaders contributing to the Report. 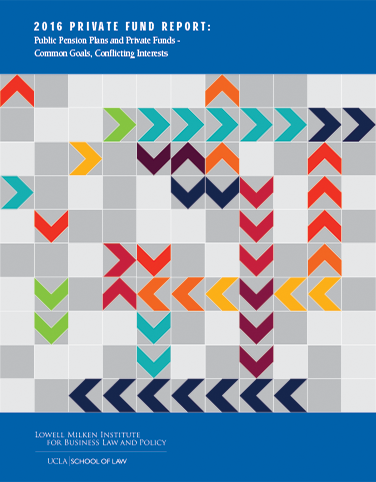 The 2015 Report is comprised of articles that look into the world of activist funds and shareholder activism to provide insight into questions such as: What are the implications for activist funds now that they have been declared an asset class? What are the biggest challenges that activist funds face in the near future? Will activist funds replace some private equity funds because of their mode of operation? The result is a collection of different perspectives reflecting conversations taking place at all levels within the private fund industry and company boardrooms. The 2014 Private Fund Report: A View From California, and the companion Private Fund Conference held in May 2014, represent the beginning of an anticipated long conversation about private funds with a special emphasis on California-based private funds. The Institute invites your comments and participation in this important conversation. 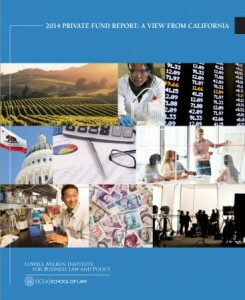 The purpose of this Report, the first in an anticipated annual series, is to provide an analysis of the intersection of private funds and the law, with a particular focus (where insightful) on the unique perspectives of California fund advisers and investors. The Report is intended to assist lawyers, investment professionals, including the staffs of fund advisers and institutional investors, regulators and other participants in asking better questions about how the law can best protect the legitimate expectations of investors, fund advisers and all of the other direct and indirect participants in the financial system.